Mom and I went to the Arts Council of Southern Indiana building to see an exhibit by our friend Ardis Moonlight, and, in addition to that, got the skinny on Little Free Libraries. They have one outside the Arts Council building, so I snapped a couple of pictures. Here’s the Little Free Library outside the Arts Council building (the ACSI website is down as of this date, but here’s the Google page). The Little Free Libraries are exactly what they sound like: they’re little waterproof boxes with doors, and they’re stocked with books. People are welcome to take books from them and are invited to replace them with other fair-condition books. Little Free Libraries are all over the world. 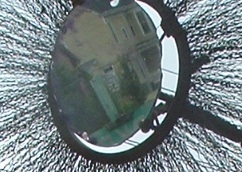 And here’s a close-up of that metallic flower sculpture thing above the Library. I love this. I just love it when stuff like this happens in a picture! In case you can’t tell, that’s the reflection of the house across the street. Crazycakes! You can follow Little Free Libraries on Facebook, Twitter, Pinterest, and YouTube. 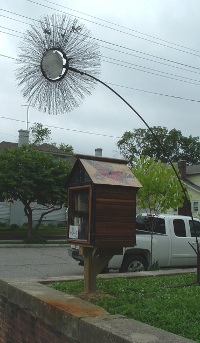 A WRITING PROMPT FOR YOU: A character takes a book from a Little Free Library and finds something between the pages that propels the action of the story. This entry was posted in Sparks o' Joy. Tagged awesomeness, books, libraries. Man, what a good idea. I could start a thousand of my own. But the street would look funny with all those boxes…. Remember that woman in Richmond near campus who turned her house into a library? Girl, I had totally forgotten! I chanced upon your Pinterest posting of a TARDIS Little Book Store yesterday. YUM! Me, too! Maybe you could go to their web site and see all the places in Indiana that have Little Free Libraries? That IS neat! I wonder if people ever think, “Oh, I can’t put THAT book out — what would the neighbors think? I’ll go buy a copy of Proust and put that out instead.”? Like the happy flower sculpture too. Charmaine Clancy would love to share..Overcoming Stress; or how I stopped being insecure about pressure and painted my nails instead. Charmaine, I hear you on the dignity boat. I’ve been much harder to embarrass since my water broke in the middle of the hospital parking lot. Yeah, I guess that pretty much did it. Marian Allen would love to share..Win A #Free #Book ! Way cool. I love the idea of Little Libraries. I may have to put one in front of my house.